American orbital launch vehicle. As Delta 4 medium but with 2 x GEM-60 solid rocket boosters and a 4 m diameter payload fairing. 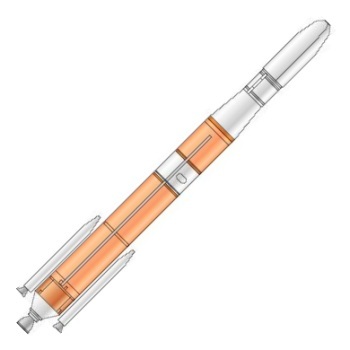 AKA: Delta IV Medium+ (4.2). Status: Active. First Launch: 2002-11-20. Last Launch: 2016-08-19. Number: 14 . Payload: 11,700 kg (25,700 lb). Thrust: 4,183.20 kN (940,421 lbf). Gross mass: 292,732 kg (645,363 lb). Height: 66.20 m (217.10 ft). Diameter: 5.00 m (16.40 ft). Apogee: 185 km (114 mi). LEO Payload: 11,700 kg (25,700 lb) to a 185 km orbit at 28.50 degrees. Payload: 5,300 kg (11,600 lb) to a GTO, 27 deg. Launch Price $: 138.000 million in 2004 dollars. Family: orbital launch vehicle. Country: USA. Engines: RL-10B-2, RS-68. Spacecraft: ANGELS, GSSAP, Quasar, HS 601, Spacebus 3000, Jumpseat-2, GPS Block 2F. Launch Vehicles: Raven. Projects: Eutelsat. Launch Sites: Cape Canaveral, Vandenberg, Cape Canaveral LC17B, Cape Canaveral LC37B, Vandenberg SLC6. Stages: Delta 4-2, Delta RS-68, GEM 60, GEM 46. Agency: Douglas.